While Young fizzled, his teammate David Murphy sizzled on his way to accumulating more fWAR in 2012 (3.9) than he had from 2009 through 2011 (3.7). Murphy finally appeared to have conquered the left-handed pitching demons that had forced him into a platoon-like role for much of his career, and the Rangers showed confidence in Murphy by naming him the everyday left fielder going into 2013. A .433 BABIP against left-handed pitchers on only 60 balls in play served as cause for concern about steep regression, but Murphy at least appeared to be a sufficient corner outfield option. Murphy stumbled out of the gate in 2013, hitting to a meager .176/.227/.297 triple-slash line in March and April, but it seemed safe to assume he would rebound to his career average rate statistics. A productive month of May (.286/.322/.524) provided the expected positive regression, but Murphy’s bat went cold again in June (.200/.283/.305), and he landed second on Mike Podhorzer’s list of unluckiest BABIPers at midseason. For fantasy purposes, Murphy looked like a buy-low candidate who could turn around quickly in the second half. Suffice it to say that he didn’t turn around. Murphy’s poor results at the plate eventually landed him on the bench in mid-September, with Jim Adduci taking the starting role in left field against righty pitchers. You probably haven’t heard of Jim Adduci, likely because he spent seven years in the minors before making his MLB debut at age 28 when rosters expanded this season. When the brief Adduci experiment failed, Craig Gentry took over in left field, and Murphy, whose last start as the Rangers’ left fielder came on September 20th, received only seven plate appearances over the final six regular season games and did not play in Game 163. The best explanation for whatever happened to Murphy over the course of 2012 and 2013 is likely that Murphy played over his head in 2012, benefited from some good luck along the way, then lost some bat speed and foot speed as he got a year older, and all the good luck from 2012 hopped on a train heading in the other direction. The tricky part is allocating the blame between lost skill and random variation. Just how unlucky must Murphy have been to have hit so poorly this season due to bad luck alone? Looking purely at the results of plate appearances over his career, one can try to quantify the bad luck through simulation. Taking Murphy’s career rates for all of his nearly 3,000 plate appearance outcomes as his true talent level, I ran 1,000,000 simulations of a 476-PA season (to match Murphy’s 476 PA from 2013). In 1,402 of those simulations – approximately one in 700 – computerized Murphy produced a wOBA (weighted on-base average) at or below the .289 mark he put up this past season. (In case you were wondering, computerized Murphy beat his .369 wOBA from 2012 in over one third of the simulations and underperformed his .227 BABIP from 2013 in about one in 40.) Events with probabilities much lower than one in 700 aren’t all that uncommon or surprising in baseball, but normally one would confidently conclude that a performance three full standard deviations below the mean indicates the influence of some factor other than random variation. Since Murphy struck out at a noticeably lower rate in 2013 than he did previously while his walk rate dipped only slightly, this mystery factor probably manifests itself in statistics concerning balls put in play. Looking the batted ball profiles, 2013 doesn’t appear all that different from 2012: Murphy pulled the ball a little more and hit fewer balls in the air, but there’s nothing to explain a drastic 43-hit difference between the seasons. Enter BABIP. Just as a deflated BABIP aided in Michael Young’s disastrous 2012 season, a poor BABIP seems to explain a sizeable chunk of David Murphy’s 2013 faceplant. From the 2008 season, Murphy’s first as a regular player, through his best year in 2012, Murphy never put up a season-long BABIP below .299. 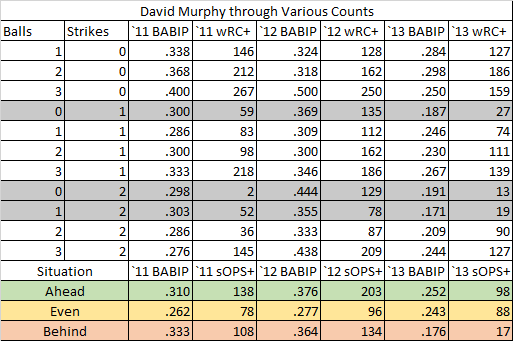 In 2013, Murphy did not record a BABIP above .299 in any calendar month. Looking at historical context makes it appear even worse. In the last decade, there have been 34 player-seasons in which a hitter reached 400 PA with a BABIP below .240. Here are the seven player-seasons with the highest line drive rate, according to FanGraphs. All the players in blue are catchers, none of whom are particularly renowned for their hit tools, so they may reasonably be expected to post low BABIP marks on occasion due to their subpar speed. Note that the correlation between BABIP and LD% was +0.579 for qualified hitters in 2013, and that the median line-drive BABIP for qualified hitters in 2013 was .699, compared to .242 for ground balls and .225 for fly balls. Murphy’s relatively meager .562 BABIP on line drives from 2013, third-to-last among qualified hitters, is likely the combination of bad luck – Rangers announcers Steve Busby and Tom Grieve pointed out that it seemed like many of Murphy’s line drives were hit right at outfielders – and a loss of bat speed that enabled infielders to snag a few more liners. However, it would be nice to get a better handle on this balance by examining the data from more angles. We have already taken a quick glance at batted ball type, but we can also break the numbers down by count as well as pitch type, pitch location, and batted ball location. The table below shows Murphy’s BABIP and wRC+ (a park- and league-adjusted measure of weighted runs created, where 100 denotes average and higher numbers are better) in plate appearances through most counts as well as his BABIP and sOPS+ (park- and league-adjusted OPS for a given split) by situation in a plate appearance. The gray rows are those in which Murphy was behind in the count at some point during the plate appearance. Murphy clearly scuffled at the plate when behind in the count; a first-pitch strike essentially reduced his offensive production per PA to that of mid-1970’s Mario Mendoza, the light-hitting shortstop for whom the Mendoza line was named. When behind in the count, Murphy produced a .291 OPS, which the 17 sOPS+ indicates is extremely poor with respect to the average hitter given that said hitter is behind the pitcher. That Murphy’s BABIP was uniformly lower through at-bats in which he was behind suggests Murphy made abnormally weak contact in those scenarios, possibly because he was swinging defensively to keep from striking out, an explanation corroborated by Murphy’s career-low strikeout rate in 2013. One would need Hit F/X or a similar data set, which is not publicly available, in order to evaluate the hypothesis that Murphy hit baseballs with much lower velocity when behind in the count. Other than functioning as a near-automatic out while behind in the count, Murphy also struggled mightily with pitches on the outer portion of the plate and with sliders in general. 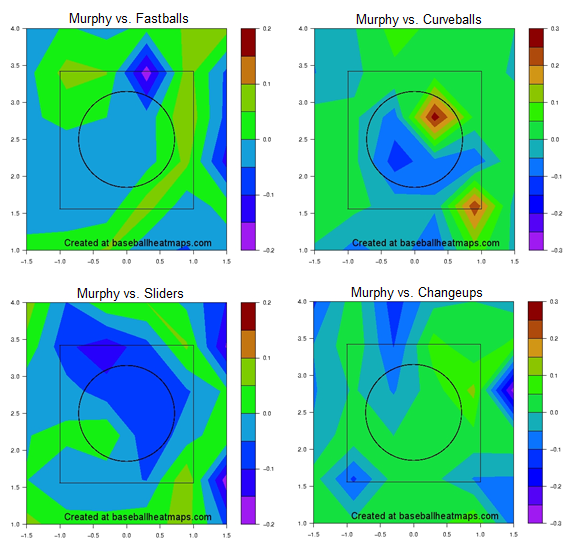 The heat maps below from Baseball Heat Maps depict Murphy’s average run-value production on all fastballs, curveballs, sliders, and changeups in 2013 by pitch location (from the catcher’s perspective) compared to the rest of his tenure as a Ranger, and the problem areas are evident. Murphy showed signs of trouble with fastballs low and away in 2013, and the spray charts below from Texas Leaguers display between Murphy’s last two seasons. In 2012, Murphy hit 43 four-seam (FF) and 16 two-seam (FT) fastballs into the gold zone between the infielders and outfielders that I drew in Microsoft Word because I know nothing about Photoshop or anything like it. A total of 30 four-seamers and 11 two-seamers fell in for hits, yielding a .695 BABIP in the gold zone. Meanwhile, in 2013 Murphy hit 26 four-seamers and 10 two-seamers into the gold zone, 13 and three of which resulted in hits, respectively, for a .444 BABIP. 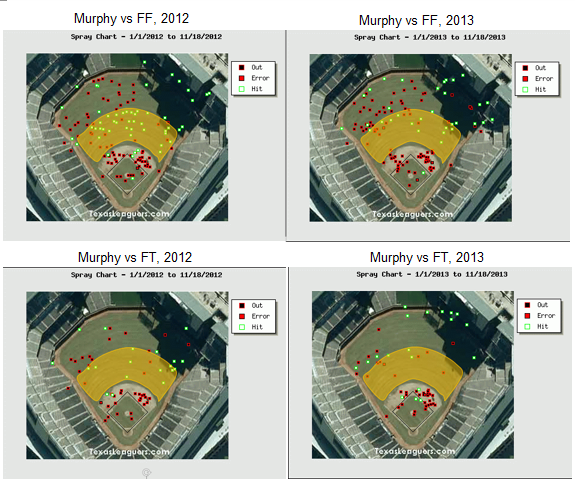 For Murphy, that meant the 2013 gold zone provided 25 fewer hits on 23 fewer balls in play. Regarding Murphy’s low relative run value in 2013 against sliders, it may have been less a matter of balls in play than an issue with making contact. From 2008 to 2012, he whiffed on 92 of 483 swings at sliders, or 19.0%. However, in 2013, Murphy swung at 105 sliders and completely missed 35 (33.3%). Missing so many sliders either led to strikeouts directly or placed Murphy further behind in the count, a situation in which he clearly struggled in 2013. The big question here concerns the extent to which Murphy can be expected to bounce back next season, and recent history provides reason for relative optimism. Since 2008, there have been 23 player-seasons in which a non-catcher recorded at least 300 PA with a BABIP below .240 and then reached at least 100 PA in the next season. Those 23 players – counting Andruw Jones and Jose Bautista twice each – averaged a .228 BABIP in the low-BABIP seasons I examined (the “averages” in this paragraph are not weighted by number of plate appearances but are instead simple arithmetic means of each player’s BABIP) compared to their .282 average career BABIP. In the year following the low-BABIP season, those players posted an average BABIP of .270, which falls below career norms but includes a significant rebound from the prior year. Given that the 23 players’ average age during the low-BABIP seasons was about 30.3, it seems intuitive that the rebound-year BABIP marks would not reach career averages since the players had passed the peak of the aging curve. In all, the rebound-year BABIP marks averaged about 96% of the respective career levels using either an arithmetic or geometric mean, projecting Murphy to record a BABIP near .287 next season. With this expected regression, one could reasonably expect Murphy to produce slightly below his career norms, which still makes him a fairly useful platoon bat with solid left-field defense and decent baserunning. Sources have stated Murphy intends to sign with Cleveland for at least two guaranteed years (probably with an option for a third year), and the Indians likely found a good value with the Murphy signing. Murphy figures to comprise the big half of a corner outfield platoon, where he fits well with the Indians’ two right-handed fourth outfielders, Drew Stubbs and Ryan Raburn. Murphy and his 0.00 career ERA might even be able to fortify the Cleveland bullpen. However, the Rangers could also make use of a left-handed corner outfielder, possibly to platoon with Craig Gentry and help hold down the fort for a few years while Nick Williams and Nomar Mazara develop. 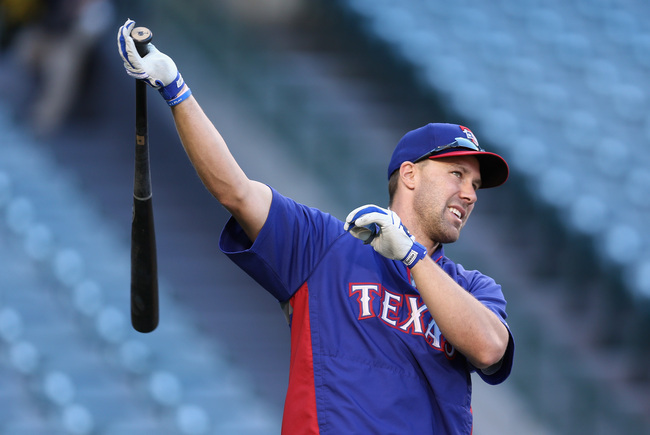 Thus with the quick signing, it appears that either Murphy too has sunk his ship as a Ranger after his poor 2013 – one of Murphy’s walk-up songs prominently featured the resonating lyric “This is not where I belong” – or the Rangers anticipate making a major deal for an outfielder by trade or in free agency. I’d bet on both. Next up in the series: Is 40 the new 30 for Bartolo Colon?